Today I am SO excited because I have a very special guest blogger. My handsome husband, Dustin, is coming on here to tell y’all about the building experience from his perspective. I can’t wait for y’all to see it through his eyes and laugh at his jokes (he’s definitely funnier than me). Enjoy! About two years ago I forced Lindsey to watch another one of my cult classics (how I married a woman that can’t recite Varsity Blues, Ghostbusters and Goodfellas from memory is beyond me), the Tom Hanks comedy The Burbs. We laughed aloud as the still funny, pre-Forrest Gump Tom and in-his-prime Cory Feldman destroyed their picturesque suburban neighborhood. However, it slowly dawned on me that soon spying on neighbors through our curtains and “walking the dog” to sneak a cigar would become my reality. Fast forward 18 months and Lindsey and I were anxiously waiting at the neighborhood Bruegger’s for a local relator to arrive. Rising rent, a couple of work promotions, and low interest rates had convinced us that we needed to start looking for a permanent home. Zillow had confirmed that it wouldn’t be in our current Myers Park neighborhood. We had done some homework looking at various neighborhoods and Charlotte suburbs but were needing some professional guidance as we quickly realized we were in over our heads. Luckily, Debbie Stallings of Pegg Properties swooped in to help point us in the right direction. I need to take a quick moment here to discuss HGTV. Personally, I believe HGTV is to house hunting what Pinterest is to weddings. Seems awesome at first, but you quickly realize that everyone’s budget is bigger than yours, those prices don’t add up, and how in the hell can two teachers have a $1.2 million budget???!!?? The worst part is the ideas it gives Lindsey. OOOOHHH the ideas. Also, House Hunters is fake and if you can’t agree on open or closed floor plan you shouldn’t be married. Anyway, back to the story. Debbie was a Godsend that was quickly able to help us realize that our best bet was going to be new construction north of the city. We checked out some developments in Huntersville and Davidson over the course of a few weeks and were honestly getting a tad discouraged. We couldn’t afford a couple of the neighborhoods that we really liked and/or they were nearly built out (which caused much higher home prices and decreased options). Some of the others weren’t in great school districts (#adulting) or weren’t near the restaurants, grocery stores, etc. we were looking for. Late one Saturday, we debated driving up to Mooresville to visit one last community. The ride up I-77 sucked, even by 77 standards and I wasn’t in a great mood. However, once we arrived at Stafford at Langtree we were thrilled we had made the trek. It was a new community, nestled between Davidson and Mooresville with several floor plans that fit our needs, reasonable building costs, and only 30 minutes from Uptown Charlotte. Best of all, Uber was available in the area. The next few weeks were a whirlwind. 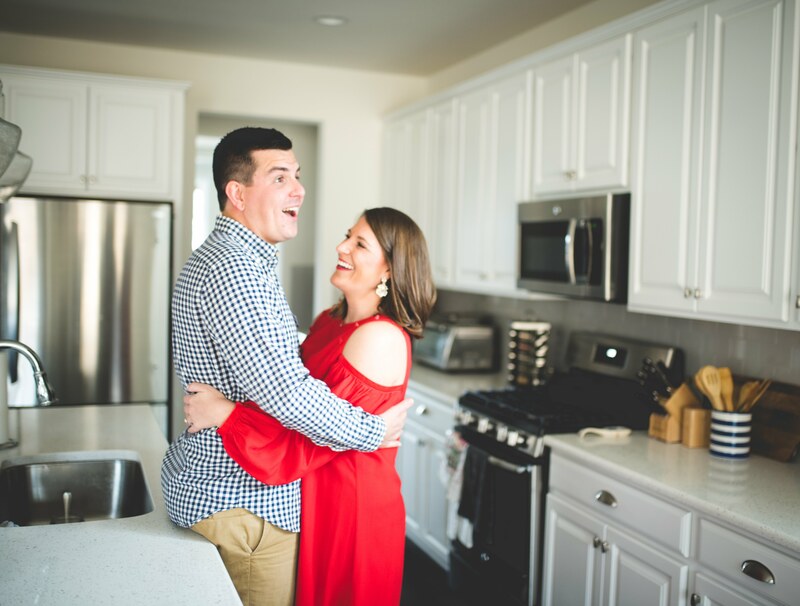 We decided that Taylor Morrison would be our preferred builder (Ryan Homes was the other option) based on floor plans and home quality and considered several home sites. We decided on one that backed up to a small field and wooded area, wrote a big check and signed paperwork the last week of May. Within a few days we were in the Taylor Morrison Design Center, spending several hours picking out every piece of our house. Hardwood color, tile, countertops, paint, front door, carpet, light fixtures, kitchen sink, toilet height- you name it and we chose it. We celebrated not getting divorced by walking over to Montford Street in Charlotte and over indulging to drown the pain of leaving the city and tying ourselves to 30 years of “memories”- although I’m sure Lindsey looked at it a little differently! Over the course of the summer we would stop by the home site and check out the progress. Building a house this way is a little unique, as we didn’t have any real input during the building process aside from a few meetings with Taylor Morrison. In some ways this could be frustrating as we weren’t able to make any changes during the process, however in general I think it a blessing as we had little to argue or worry about during the actual build. On November 30th we signed our mortgage paperwork and were handed the keys to our new home. It had turned out beautifully and we were excited to take the next step……at least until the lawyer’s secretary told us to “say 30-year mortgage” while snapping our photo. We took a couple of weeks to move all of our belongings over from our apartment, and have spent the past 6 weeks or so slowly filling our house with furniture while Lindsey does her best to make it a home. It’s been an incredibly exciting and fulfilling process and I’m honestly proud of how we were able to work as a team to make it possible. There were far more laughs than tears, and as much as I miss our old neighborhood it’s nice to be able to go somewhere other than the guest bed if we get in an argument. I think we both agree that aside from our engagement and wedding it’s the biggest step we’ve ever taken together and we look forward to many years of memories to be made (and tans to be had at the pool). Ok, seriously. How cute is he?! I hope y’all loved hearing from Dustin as much as I loved having him write this. I’m excited to be able to share our home with you and I look forward to revealing more of it as we continue to settle in and decorate!